Research Assistant Madeline Schneider at the 2018 Pediatric Academic Society Conference in Toronto. 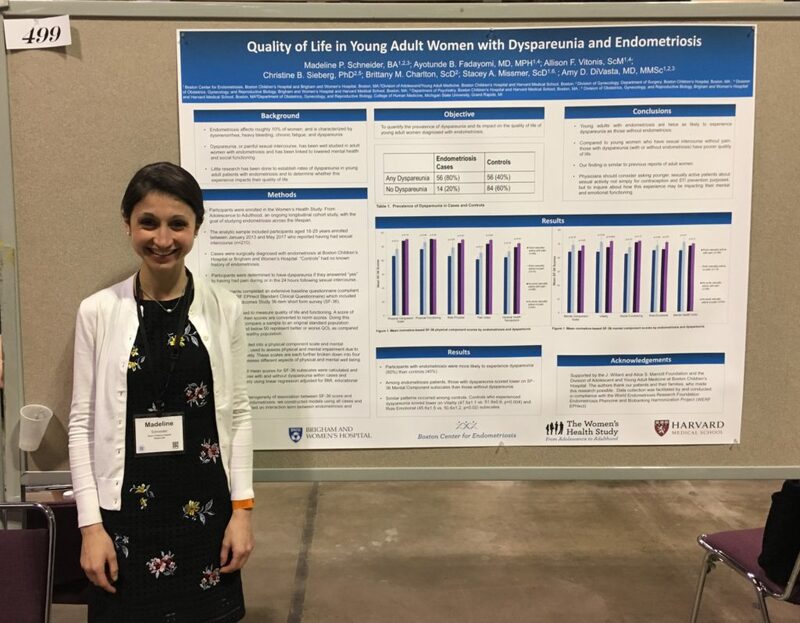 Ms. Schneider gave a poster presentation on her work exploring the impact dyspareunia has on quality of life in endometriosis patients. Dr. Paula Brady at the 2017 New England Fertility Society Annual Meeting. 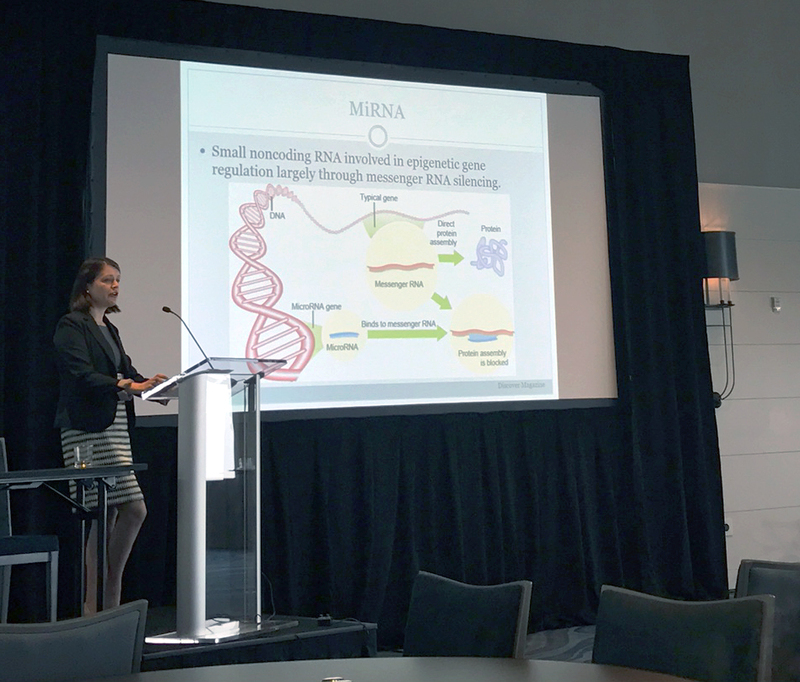 Dr. Brady presented first step results from a study of microRNA as a potential diagnostic for endometriosis. 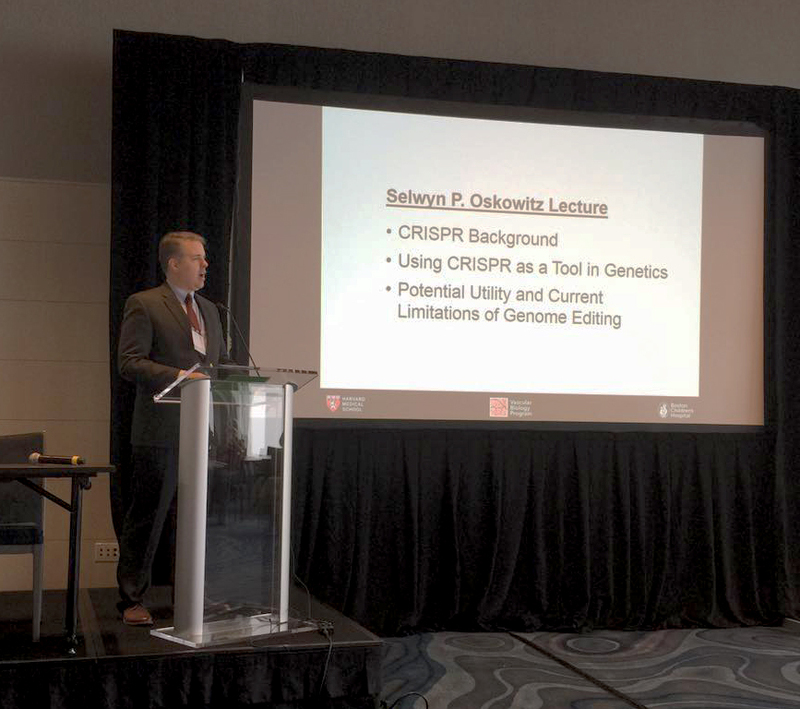 Michael Rogers giving the 3rd Annual Selwyn P. Oskowitz lecture at the 2017 New England Fertility Society Meeting. The lecture was titled “Feasibility of Multiplex CRISPR-mediated Germline Modification”. 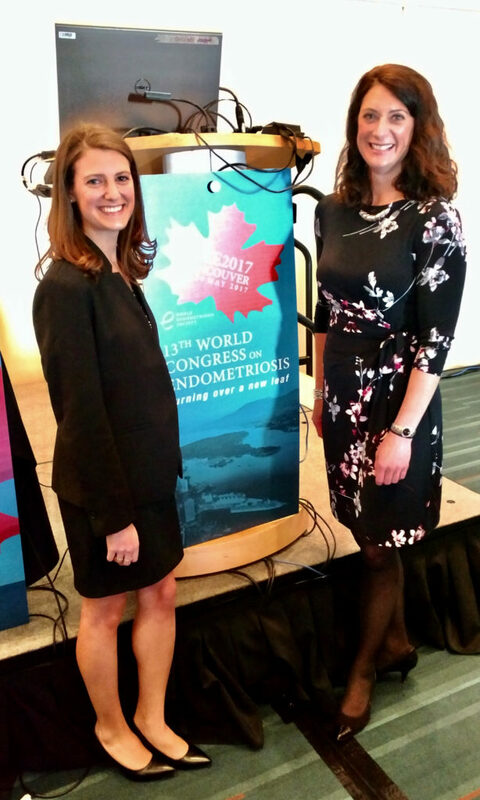 Jerri Miller, former research assistant, and Dr. Amy DiVasta, Co-Director of Clinical Research at the 2017 World Congress of Endometriosis. Ms. Miller gave an oral presentation of their work exploring the prevalence of migraines in adolescents. This was 1 of 18 presentations given by our group at the conference. Gallagher JS, Missmer SA, Hornstein MD, Laufer MR, Gordon CM, DiVasta AD. Long-term effects of gonadotropin-releasing hormone agonists and add-back in adolescent endometriosis. J Pediatr Adolesc Gynecol 2018; DOI: 10.1016/j.jpag.2018.03.004. Miller JA, Missmer SA, Vitonis AF, Sarda V, Laufer MR, DiVasta AD. The prevalence of migraines in adolescents with endometriosis. Fertil Steril 2018; DOI: 10.1016/j.fertnstert.2017.12.016. Rahmioglu N, Becker CM, Missmer SA, Zondervan KT. Harmonization of Clinical and Laboratory Data to Improve Biomarker Discovery in Endometriosis: WERF EPHect. In Biomarkers for Endometriosis. T D’Hooghe (ed), Springer Science, New York, 2015. Farland LV, Shah DK, Kvaskoff M, Zondervan K, Missmer SA. Epidemiological and Clinical Risk Factors for Endometriosis. In Biomarkers for Endometriosis. T D’Hooghe (ed), Springer Science, New York, 2015. Kvaskoff M, Mu F, Terry KL, Harris HR, Poole EM, Farland L, Missmer SA. Endometriosis: a high-risk population for major chronic diseases? Hum Reprod Update. 2015 Jul-Aug;21(4):500-16. PMID: 25765863. Pencovich N, Luk J, Hantisteanu S, Hornstein MD, Fainaru O. The development of endometriosis in a murine model is dependent on the presence of dendritic cells. Reprod Biomed Online 2014 Apr;28:515-21. Silveira SA, Laufer MR. Persistence of endometriosis after correction of an obstructed reproductive tract anomaly. J Pediatr Adolesc Gynecol 2013; Aug;26(4):e93-4. DiVasta AD, Laufer MR. The use of gonadotropin releasing hormone analogues in adolescent and young patients with endometriosis. Curr Opin Obstet Gynecol. 2013 Aug;25(4):287-92. Nyholt DR, Low SK, Anderson CA, Painter JN, Uno S, Morris AP, MacGregor S, Gordon SD, Henders AK, Martin NG, Attia J, Holliday EG, McEvoy M, Scott RJ, Kennedy SH, Treloar SA, Missmer SA, Adachi S, Tanaka K, Nakamura Y, Zondervan KT, Zembutsu H, Montgomery GW. Genome-wide association meta-analysis identifies new endometriosis risk loci. Nat Genet. 2012;44(12):1355-9. PMCID: PMC3527416. Carvalho L, Missmer SA. IVF Treatment in Patients with Endometriosis: A Challenger Approach. Journal of Fertilization: In vitro. 2012, J Fertiliz in Vitro 2:1. Missmer SA. In 50 Clinical cases that all gynecologist and obstetrician should know. Carvalho L, Korkers H, Sass N. Abrão MS. AC Farmacêutica| GEN, São Paulo Brazil, 2012. Kaser DJ, Missmer SA, Berry KF, Laufer MR. Use of norethindrone acetate alone for postoperative suppression of endometriosis symptoms. J Pediatr Adolesc Gynecol. 2012;25(2):105-8. Schernhammer ES, Vitonis AF, Rich-Edwards J, Missmer SA. Rotating nightshift work and the risk of endometriosis in premenopausal women. Am J Obstet Gynecol. 2011;205(5):476 e1-8. PMC3205317. Huang E, Hornstein MD, Stewart EA, Crum CP. Evaluation of the cyclic endometrium and benign endometriosis disorders. In: Diagnostic Gynecologic and Obstetric Pathology (2nd Edition), CP Crum, MR Nucci, KR Lee (eds), Elsevier, Philadelphia, 2011;407-56. Shah DK, Missmer SA. Scientific investigation of endometriosis among adolescents. J Pediatr Adolesc Gynecol. 2011 Oct; 24(5 Suppl):S18-9. Laufer MR. Helping “adult gynecologists” diagnose and treat adolescent endometriosis: reflections on my 20 years of personal experience. J Pediatr Adolesc Gynecol 2011 Oct;24(5 Suppl):S13-17. Goldstein DP, Missmer SA, Shah DK. Complexities of Design for the Study of Endometriosis. In Touch Briefings: Challenges in Endometriosis 2011. Mettler L European Obstetrics & Gynecology, Volume 6, Issue 2, Autumn 2011. Amarosa EJ, Mascimante AF, Hornstein MD, Crum CP. Benign conditions of the ovary, evaluation of the cyclic endometrium and benign endometriosis disorders. In: Diagnostic Gynecologic and Obstetric Pathology (2nd Edition), CP Crum, MR Nucci, KR Lee (eds), Elsevier, Philadelphia, 2011;679-716. Laufer MR, Missmer SA. Does complete laparoscopic excision of endometriosis in teenagers really occur? Fertil Steril. 2011 Sep; 96(3):e145. Epub 2011 Jul 18. Missmer SA, Bove GM. A pilot study of the prevalence of leg pain among women with endometriosis. J Body Mov Ther. 2011;15(3):304-8. PMC3115527. Missmer SA, Shah DK. Complexities of Design for the Study of Endometriosis. In Touch Briefings: Challenges in Endometriosis 2011. Mettler L. US Obstetrics & Gynecology, Volume 6, Issue 1, Summer 2011. Unger CA, Laufer MR. Progression of endometriosis in non-medically managed adolescents: A Case Series. J Pediatr Adolesc Gynecol 2011 Apr1; 24(2):e21-23. Guzick DS, Huang LS, Broadman BA, Nealon M, Hornstein MD. Randomized trial of leuprolide versus continuous oral contraceptives in the treatment of endometriosis-associated pelvic pain. Fertil Steril 2011 Apr;95:1568-73. Rauh-Hain JA, Laufer MR. Increased diagnostic accuracy of laparoscopy in endometriosis using indigo carmine: a new technique. Fertil Steril 2011 Mar; 95(3):1113-1114. Weuve J, Hauser R, Calafat AM, Missmer SA, Wise LA. Association of exposure to phthalates with endometriosis and uterine leiomyomata: findings from NHANES, 1999-2004. Environmental health perspectives. 2010 Jun;118(6):825-32. PMC2898860. Shah D, Missmer SA. Epidemiology of Endometriosis. In Endometriosis – Adenomyosis. A Arici, I Matalliotakis (eds), PMP (Paschalides Medical Publications), Athens, Greece, 2010. Missmer SA, Chavarro JE, Malspeis S, Bertone-Johnson ER, Hornstein MD, Spiegelman D, Barbieri RL, Willett WC, Hankinson SE. A prospective study of dietary fat consumption and endometriosis risk. Hum Reprod. 2010 Jun;25(6):1528-35. PMC2873173. Vitonis AF, Baer HJ, Hankinson SE, Laufer MR, Missmer SA. A prospective study of body size during childhood and early adulthood and the incidence of endometriosis. Hum Reprod. 2010 May;25(5):1325-34. PMC2854045. Mok-Lin EY, Wolfberg, A, Hollinquist H, Laufer MR. Endometriosis in a patient with Mayer-Rokitansky-Kuster-Hauser (MRKH) syndrome and complete uterine agenesis: Evidence to support the theory of coelomic metaplasia. J Pediatr Adolesc Gynecol 2010 Feb; 23(1):e35-37. Vitonis AF, Hankinson SE, Hornstein MD, Missmer SA. Adult physical activity and endometriosis risk. Epidemiology 2010 Jan;21:16-23. Ahn AC, Schnyer R, Conboy L, Wayne P, Laufer MR. Electrodermal measures of Jin-Well Points and their clinical relevance in endometriosis-related chronic pelvic pain. J Altern Complement Med 2009 Dec; 15(12):1293-1305. Doyle JO, Missmer SA, Laufer MR. The effect of combined surgical-medical intervention on the progression of endometriosis in an adolescent and young adult population. J Pediatr Adolesc Gynecol. 2009 Aug;22(4):257-63. Vitonis AF, Maruti SS, Hankinson SE, Hornstein MD, Missmer SA. Adolescent physical activity and endometriosis risk. Endometriosis 2009 Jul;3:157-63. 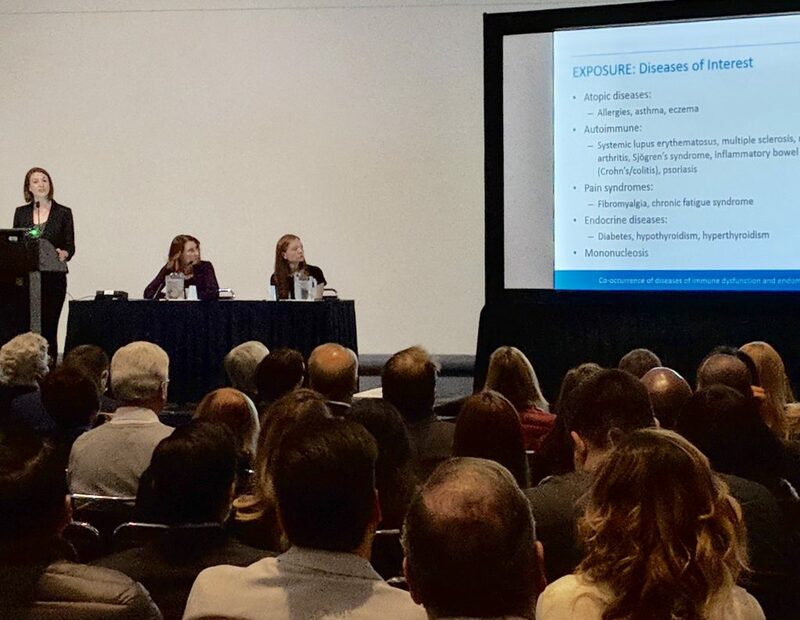 Laufer MR. Current approaches to optimizing the treatment of endometriosis in adolescents. Gynecol Obstet Invest 2008; 66 Suppl 1:19-27. Wayne PM, Kerr CE, Schnyer RN, Legezda AT, Savetsky-German J, Shields MH, Buring JE, Davis RB, Conboy LA, Highfield ES, Parton B, Thomas PP, Laufer MR. Japanese-Style acupuncture for endometriosis-related pelvic pain in adolescents and young women: Results of a randomized sham-controlled trial. J Pediatr Adolesc Gynecol 2008; 21(5):247-257. Missmer SA, Mohllajee AP. The etiology of endometriosis: Environment. In Endometriosis 2008. L Rombauts, J Tsaltas, P Maher, D Healy (eds), Blackwell Publishing, Oxford, 2008. Fainaru O, Adini A, Benny O, Adini I, Short S, Bazinet L, Nakai K, Pravda E, Hornstein MD, D’Amato RJ, Folkman J. Dendritic cells support angiogenesis and promote lesion growth in a murine model of endometriosis. FASEB J 2008 Feb;22:522-9. DiVasta AD, Laufer MR, Gordon CM. Bone density in adolescents treated with a GnRH agonist and add-back therapy for endometriosis. J Pediatr Adolesc Gynecol 2007; 20(5):293-297. Highfield ES, Laufer MR, Schnyer R, Kerr CE, Thomas P, Wayne PM. Adolescent endometriosis-related pelvic pain treated with acupuncture: Two case reports. J Altern Complement Med 2006; 12:317-322. Missmer SA, Spiegelman D, Hankinson SE, Malspeis S, Barbieri RL, Hunter DJ. Natural hair color and the incidence of endometriosis. Fertility and sterility. 2006;85(4):866-70. American College of Obstetricians and Gynecologists. Endometriosis in adolescents. ACOG Committee Opinion 310. Obstet Gynecol 2005; 105:921-927. Crum CP, Hornstein MD, Stewart EA. Evaluation of cyclic endometrium and benign endometrial disorders. In: Diagnostic Gynecologic and Obstetric Pathology. Crum CP and Lee KR (eds), W.B. Saunders, Philadelphia, 2005;441-91. Davis LB, Hornstein MD. Painful menstruation: In: The Abnormal Menstrual Cycle. Rees M, Hope S, Ravnikar VA (eds), Taylor & Francis, London, 2005;9-26. Marsh E, Laufer MR. Endometriosis in premenarchal girls without an associated obstructive anomaly. Fertil Steril 2005; 83:758-760. Missmer SA, Hankinson SE, Spiegelman D, Barbieri RL, Michels KB, Hunter DJ. In utero exposures and the incidence of endometriosis. Fertil Steril. 2004;82(6):1501-8. Missmer SA, Hankinson SE, Spiegelman D, Barbieri RL, Malspeis S, Willett WC, Hunter DJ. Reproductive history and endometriosis among premenopausal women. Obstet Gynecol. 2004;104(5 Pt 1):965-74. Missmer SA, Hankinson SE, Spiegelman D, Barbieri RL, Marshall LM, Hunter DJ. Incidence of laparoscopically confirmed endometriosis by demographic, anthropometric, and lifestyle factors. Am J Epidemiol. 2004;160(8):784-96. Missmer SA, Cramer DW. The epidemiology of endometriosis. Obstet Gynecol Clin North Am. 2003; 30(1):1-19. Kuohung W, Jones GC, Vitonis AF, Cramer DW, Kennedy SH, Thomas D, Hornstein MD. Characteristics of patients with endometriosis in the United States and the United Kingdom. Fertil Steril 2002 Oct;78:767-72. Surrey ES, Hornstein MD. Prolonged GnRH agonist and addback therapy for symptomatic endometriosis: Long term follow-up. Obstet Gynecol 2002 May;99:709-19. Barbieri RL, Missmer S. Endometriosis and infertility: a cause-effect relationship? Ann N Y Acad Sci. 2002 Mar;955:23-33; discussion 34-6, 396-406. Hornstein MD. Hormonal add-back and the estrogen therapeutic window in the treatment of endometriosis. Advances in Obstetrics and Gynecology. Sanka K and Gakkai F (eds), Kyōto-Shi, Japan 2000;52:252-4. Propst AM, Laufer MR. Diagnosing and treating adolescent endometriosis. Contemp Pediatr 2000; 17:71-78. Propst AM, Laufer MR. Diagnosing and treating adolescent endometriosis. Contemp Nurse Practitioner 2000; 4:11-18. Propst AM, Laufer MR. Diagnosing and treating adolescent endometriosis. Contemp Ob/Gyn 1999; 44:52-59. Propst AM, Laufer MR. Endometriosis in adolescents. Incidence, diagnosis and treatment. J Reprod Med 1999 Sep; 44:751-758. Hornstein MD. Expanding the utility of the GnRH-agonists in the treatment of endometriosis. In: Understanding Endometriosis: Understanding and Managing Endometriosis: Advances in Research and Practice. Lemay A and Maheux R (eds), Parthenon Publishing, New York, 1999;205-10. Economy KE, Laufer MR. Pelvic pain. Adolesc Med 1999 Jun; 10(2):291-304. Hornstein MD, Barbieri RL. In: Kistner’s Gynecology and Women’s Health. Ryan KJ, Berkowitz RS, Barbieri RL, Dunaif A (eds), Mosby, St. Louis, 1999;482-518. Laufer MR, Heerema AE, Parsons KE, Barbieri RL. Endosalpingiosis: Clinical presentation and follow-up. Gynecol Obstet Invest 1998; 46:195-198. Yanushpolsky EH, Best CL, Jackson KV, Clarke RN, Barbieri RL, Hornstein MD. Effects of endometriomas on oocyte quality, embryo quality, and pregnancy rates in in vitro fertilization cycles: a prospective case-controlled study. J Asst Reprod Genet 1998 Apr;15:193-7. Lubianca JN, Gordon CM, Laufer MR. “Addback” therapy for endometriosis in adolescents. J Reprod Med 1998 Mar; 43:164-172. Polan ML, Henzl MR, Hornstein MD (eds). The second decade of GnRH agonists: In vitro fertilization and endometriosis: A symposium. J Reprod Med 1998 Mar;43 (Suppl.). Banerjee R, Laufer MR. Reproductive disorders associated with pelvic pain. Semin Pediatr Surg 1998 Feb;7(1):52-61. Hornstein MD, Surrey ES, Weisberg GW, Casino LA for the Lupron Add-Back Study Group. Leuprolide acetate depot and hormonal add-back in endometriosis: a 12 month study. Obstet Gynecol 1998 Jan;91:16-24. Laufer MR, Goitein L, Bush M, Cramer DW, Emans SJ. Prevalence of endometriosis in adolescent women with chronic pelvic pain not responding to conventional therapy. J Pediatr Adolesc Gynecol 1997 Nov; 10(4):199-202. Hornstein MD, Hemmings R, Yuzpe AA, Heinrichs WL. Use of nafarelin versus placebo after reductive laparoscopic surgery for endometriosis. Fertil Steril 1997 Nov;68:860-4. Robinson RR, Hornstein MD. Role of the assisted reproductive technologies in the treatment of endometriosis associated infertility. In: Endometrium and Endometriosis. Osteen K and Diamond MP (eds), Blackwell Science, Malden, MA, 1997;255-62. Laufer MR. Identification of clear vesicular lesions of atypical endometriosis: A new technique. Fertil Steril 1997 Oct; 68(4):739-740. Hornstein MD, Yuzpe AA, Burry K, Buttram VC Jr, Heinrichs LR, Soderstrom RM, Steinberger E, Lin JS. Retreatment with nafarelin for recurrent endometriosis symptoms: efficacy, safety, and bone mineral density. Fertil Steril 1997 Jun;67:1013-8. Gargiulo AR, Hornstein MD. The role of GnRH agonists plus add-back therapy in the treatment of endometriosis. Semin Reprod Endocrinol 1997;15:273-84. Hornstein MD, Thomas PP, Sober AJ, Wyshak G, Albright NL, Frisch RE. Association among endometriosis, dysplastic nevi and history of melanoma in women of reproductive age. Hum Reprod 1997 Jan;12:143-5. Cramer DW, Hornstein MD, Ng WG, Barbieri RL. Endometriosis associated with the N314D mutation of galactose-1-phosphate uridyl transferase (GALT). Mol Hum Reprod 1996 Mar;2:149-52. Hornstein MD, Yuzpe AA, Burry KA, Heinrichs LR, Buttram VC Jr. Orwoll ES. Prospective randomized double-blind trial at 3 versus 6 months of nafarelin therapy for endometriosis associated with pelvic pain. Fertil Steril 1995 May;63:955-62. Hornstein MD. Endometriosis “add back” therapy. In: Progress in the Management of Endometriosis. Coutinho EM (ed), Parthenon Publishing, New York, 1995;209-14. Hornstein MD (ed). Clinical aspect of endometriosis. In: Clinical Consultations in Obstetrics and Gynecology, Vol. 7, No. 3, 1995. Hornstein MD, Harlow BL, Thomas PP, Check JH. Use of a new CA125 assay in the diagnosis of endometriosis. Hum Reprod 1995 Apr;10:932-4. Hornstein MD, Barbieri RL. In: Kistner’s Gynecology: Principles and Practice. Ryan KJ, Berkowitz RS, Barbieri RL (eds), Mosby, Boston, 1995;251-77. Check JH, Hornstein MD. Endometriosis causing very high early first trimester serum CA125 levels (letter). Int J Gynaecol Obstet 1995 Feb;48:217-8. Orwoll ES, Yuzpe AA, Burry KA, Heinrichs L, Buttram VL, Jr., Hornstein MD. Nafarelin therapy in endometriosis: Long‑term effects on bone mineral density. Am J Obstet Gynecol 1994 Nov;171:1221-5. Hornstein MD, Gleason RE, Orav J, Haas ST, Friedman AJ, Rein MS, Hill JA, Barbieri RL. The reproducibility of the revised American Fertility Society classification of endometriosis. Fertil Steril 1993 May;59:1015‑21. Hornstein MD, Thomas PP, Gleason RE, Barbieri RL. Menstrual cyclicity of CA-125 in patients with endometriosis. Fertil Steril 1992 Aug;58:279‑83. Hornstein MD. Endometriosis and spontaneous abortion. In: Recurrent Pregnancy Loss, Infertility and Reproductive Medicine Clinics of North America. Friedman AJ (ed), W.B. Saunders Co, Philadelphia, 1991;2:175‑85. Hornstein MD, Gleason RE, Barbieri RL. A randomized double-blind prospective trial of two doses of gestrinone in the treatment of endometriosis. Fertil Steril 1990 Feb;53:237‑ 41. Barbieri RL, Hornstein MD. In: Kistner’s Gynecology: Principles and Practice. Ryan KJ (ed), Year Book Medical Publishers, Chicago, 1989;302-48. Hornstein MD, Barbieri RL. Endocrine therapy of endometriosis: Danazol and the synthetic progestins. In: Reproductive Endocrine Therapeutics. Barbieri RL and Schiff I (eds), Alan R. Liss, New York, 1988;155‑85. Barbieri RL, Hornstein MD. Medical therapy for endometriosis. In: Endometriosis, Wilson EA (ed). Alan R. Liss, New York, 1987;111‑40. Goldstein DP, deCholnoky C, Emans SJ. Adolescent endometriosis. J Adol Health Care 1980; 1:37-41. Goldstein DP, deCholnoky C, Emans SJ, Leventhal JM. Laparoscopy in the diagnosis and management of pelvic pain in adolescents. J Reprod Med 1980;24:251-6. Goldstein DP, deCholnoky C, Leventhal JM, Emans SJ. New insights into the old problem of chronic pelvic pain. J Pediatr Surg 1979 Dec;14(6):675-80.